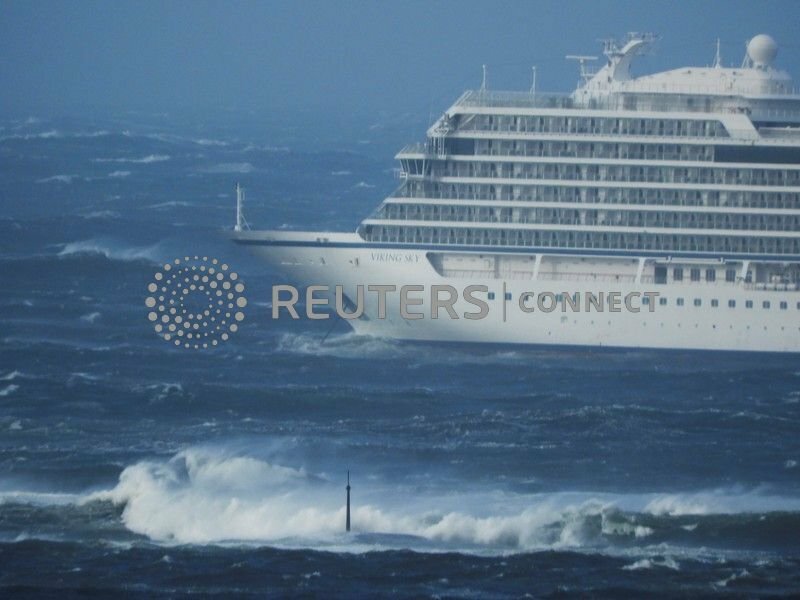 The maritime rescue service said the Viking Sky, with 1,373 passengers and crew on board, had sent out a mayday signal as it had been drifting towards land in the Norwegian Sea. The crew was able to restart one of the ship's four engines and the vessel was at anchor about 2 km (1.24 miles) from land and the passengers were considered safe although the evacuation was set to continue throughout the night. Some 155 people had been evacuated by 2140 GMT, rescue service spokesman Per Fjeld said. The sea was very rough and eight of those pulled from the ship had suffered injuries, with three of those considered severe, public broadcaster NRK reported, quoting unnamed sources. Images and film posted by passengers on social media showed furniture sliding around as the vessel drifted in waves of up to eight metres (26 feet). A second vessel, a freighter with a crew of nine, was also being evacuated nearby after suffering engine failure, diverting helicopters and thus delaying the cruise ship airlift, the rescue centre added. The wind was blowing at 24 metres per second (86 kph/54 mph), according to the Norwegian Meteorological Institute, and the storm was expected to last at least until midnight local time (2300 GMT). Norway is considering safety improvements for those travelling along its extensive coastline, including preliminary plans for a giant ocean tunnel through a mountain near the spot where the Viking Sky had halted. They're building these things bigger and bigger and packing more and more human cattle and sheeple into them. Imagine if a contagious virus was spread by one of the el cheapo staff they recruit on their journeys.The ship would become a floating morgue. These jugernaughts look the same as the live sheep carriers that take thousands of hapless creatures from OZ to Saudi Arabia for slaughter. What makes you think that the ship is unstable? The main problem with cruise ships is their "sail area", the large number of decks, mostly empty that cause strong winds to be a problem. It's notgoing to capsize the ship though. As long as the anchors hold it doesn't much matter if they are 100m offshore or 100 miles. What they need is a tug, which I guess is enroute. Hustadvika is one of 3 areas along the Norwegian coast where the seas can get WILD rapidly. Sounds rather odd though, 4 out of 4 engines failing. Noing nothing else of the matter, One might first suspect fuel quality or fuel pumps. god i wish they had this in Hua Hin. I would be the first to be lifted out of this giant landlocked cruise ship. I am a licensed Master Mariner,Oceans, Steam or Motor, Any Gross Tonnage, as well, if that's what you are. Tell me about all the cruise ships you are aware of that have capsized without having run aground first. The Estonia was not a cruise ship, it was a ferry which had bow doors that became not watertight in a storm, but not a particularly singular storm in the Balitc. It flooded. The Korean ship was overloaded and also a ferry. I'm struggling to understand how a diesel electric cruise ship can have engine failure. It has four engines. Also more than one propulsion motor. Even if someone forgot the transfer fuel to a day tank that would probably only have been for one engine.